Overseas Filipino Workers (OFWs) will be experiencing soon a fast, easy and more accessible way in paying their membership in Overseas Welfare Workers Administration (OWWA). Last January 17, OWWA entered into a Memorandum of Agreement with the Landbank of the Philippines (LBP) for the implementation of online payment of OWWA membership thru Electronic Payment Portal (ePP) of the bank. The ePP, is an internet-based payment system of the LandBank. 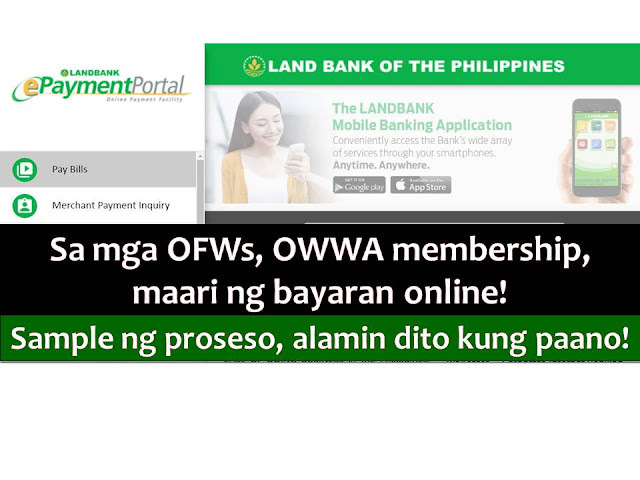 This system will be accessible to Balik Manggagawa OFWs who need to renew their OWWA membership by allowing them to pay their contributions via the internet using any of the payment options offered by the LandBank. According to OWWA Administrator Hans Leo J. Cacdac, this collaboration with LandBank will provide OWWA members with faster and more accessible means of renewing their membership. 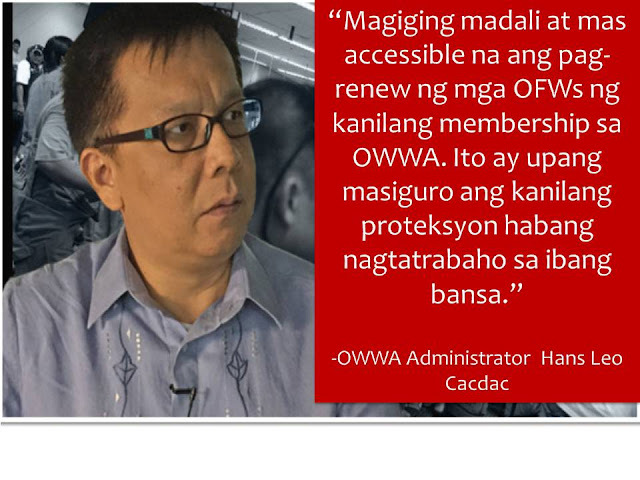 Cacdac added that they are continually working hard to integrate programs that will enhance services given to their clients, the OFWs. How to use the Electronic Payment Portal, internet-base payment system of the LandBank? Here's a sample since as of writing OWWA is not yet in the system. 2. Click the "Pay Bills" in the upper left menu. 3. In the alphabet display, Click letter "O" stands for Overseas Workers Welfare Administration (OWWA) membership fee. *as of writing OWWA is not yet in the system so we choose other option. 4. Choose your payment option and provide the information needed.